One of the frequent challenges in the aging years is the ability to walk. One little slip can put them at risk for an injury or disability. Hence, whether inside the home or outdoors, the older adult has to be assisted in ensuring that their walking environment is safe for them. Whenever your aging loved one reports of feeling some pain when they walk, its cause has to be verified by the doctor. Their pain in walking can be a factor for them to lose balance when they walk unassisted. If your aging parent is recovering from a condition that renders them with mobility difficulties, they could get help from licensed therapists to restore this important skill. These healthcare providers can set up a walking program that your loved one can follow through. They have to relearn how to walk or else they can be easily prone to falls. Getting on a pair of comfortable shoes can also help your elderly parent to walk safely and conveniently. The key is to have these shoes well-fitted and provide proper arch support on their footing so they can balance properly. Many older adults can manage walking on their own, especially at home. However, someone should always be on the ready to give assistance in case this becomes a little too difficult. Stay in areas at home or outdoors where there is installed adequate home maintenance in New Jersey. These locations can be easier for aging individuals to navigate, hence, keeping them safe on their own. 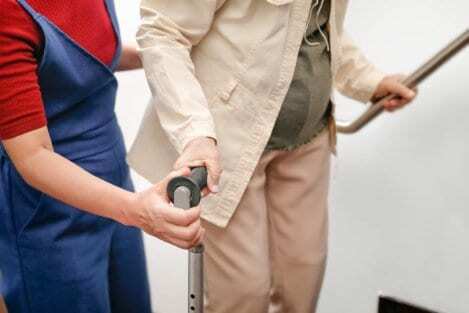 Elderly people can also keep their balance with assistance from mobility aids, such as canes and walkers. These devices are, in fact, helpful to increase their sense of independence even with their mobility challenges. When walking outdoors, try to choose the areas where there are lesser people who can potentially bump on you when they’re in a hurry. Better yet, go outdoors during times of the day when it’s not the peak hour or when most people are already in their workplaces. The welfare of your aging family members always comes first when it comes to their walking activities. Our team at AIP MOBILITY PLUS understands how this is such a great need, hence, we provide home solutions to secure your elderly loved ones at home. We provide home modifications, such as grab bar installation in New Jersey so that walking independently is possible for your loved one while their safety is still in check. Is there a part at home which you want to be fixed and adjusted to fit your aging parent’s safety? We can plan this out with you. Call us to inquire more about the services we provide.